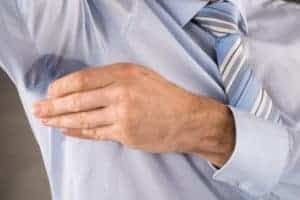 If you are looking for tips to stop excessive sweating, you might be suffering from a condition known as hyperhidrosis. This condition occurs in varying degrees of severity and has a wide range of treatment options. Before we get to those proactive treatments for hyperhidrosis, here are some tips to stop excessive sweating before it happens in the first place. Since stress and anxiety can trigger a sweating response, reducing the frequency of these could lead to less sweating. Though it isn’t always possible to avoid stressful and anxiety-inducing situations, finding outlets that mitigate the effects can be beneficial. This is true whether or not you have hyperhidrosis, as anxiety takes a negative toll on your life in many other ways. This might not work for people with severe hyperhidrosis, but if your environment is colder than your body is used to, you might sweat less. Heat causes the body to produce sweat in order to cool down the body. If there is no heat, and you have a minor form of the condition, you might find yourself naturally sweating less. Store bought antiperspirant does the job for most people, but not everybody. Even individuals who don’t have hyperhidrosis may find themselves sweating through their deodorant after intense physical activity. That doesn’t mean all deodorant is ineffective though. Ask your doctor about prescription grade antiperspirants. It could take care of your sweating problem without resorting to more expensive medical treatment. If nothing else is working, consult with your doctor about a revolutionary treatment called Iontophoresis. This treatment involves minor electrical currents that run through water in which your hand (or other body parts) is submerged. The exact reason for its efficacy is not fully known, but between six and ten treatments will cause your sweat glands to shut down. This has been the standard treatment for excessive sweating in Europe for decades, but this exciting treatment is now available with a prescription within the United States. If you are interested in putting an end to your excessive sweating, then you may consider trying everything above. Start out with simple solutions, and if they don’t work, talk to your doctor about more preventative methods. Bring up Iontophoresis devices and get their medical opinion. Treating hyperhidrosis is difficult due to the less than complete medical understanding of what causes it to occur. Luckily, Iontophoresis is helping Doctors find a better understanding of the condition, and perhaps, a cure. Sweating is a very normal secretion that everyone experiences. Exercise, heat, dancing, and many other activities cause people to sweat. People even sweat when they’re nervous. All of these examples are commonly shared reasons to sweat amongst human beings. Sweating is actually beneficial to the human body, even though many people consider it to be gross. Sweating rids the body of toxins and helps regulate our temperature. Because of this, sweating actually serves a critical role in our body’s homeostasis. Although everyone sweats, and it is very normal and healthy, everyone has their own unique way of sweating. Some people barely sweat, while others sweat quite a bit more. How do you know when your sweating is so severe it qualifies as a medical problem? Hyperhidrosis is a sweating condition where an individual sweats excessively. The excessive sweat is typically contained in focused areas like hands, feet, and/or underarms, but this isn’t always the case. Sometimes the sweat appears all over the body. Currently, there is no known cause. However, most medical experts believe that hyperhidrosis is linked to an underlying health issue, like obesity or anxiety. Here are the most common symptoms of hyperhidrosis, according to Medical News Today. 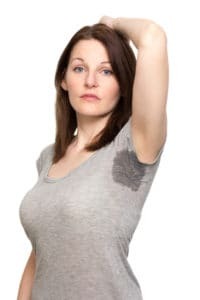 If these symptoms sound familiar to you, and you think you may have hyperhidrosis because you are sweating constantly, then it’s time to learn how to control excessive sweating for you. It is important to know that you are not alone. In America, there are 8 million people affected by hyperhidrosis, and they sweat four to five times as much as the average citizen. The good news is that it is possible to control excessive sweating with the help of treatments for hyperhidrosis. The treatment is referred to as iontophoresis treatment. According to Sweat Help, iontophoresis treatment involves machines that send small electrical currents through trays of water that the patient places their hands and feet in. These treatments need to be administered regularly in order to remain effective. Initially, three times per week is recommended until the patient is satisfied with the results. Then the patient will be switched to the maintenance schedule of just once per week, according to Help Sweat. If you are suffering from hyperhidrosis based on these common symptoms, remember that there is treatment available for you!